Oftentimes we don’t expect to see art projects, or crafts being done in a core content middle school classroom. In my classroom, the markers and colored pencils would come out for projects, or small group work. Art was usually incorporated into summative assessments, not used to facilitate thinking during the learning process. Then I read We Are All Artists by Joshua Block. In the article he wrote, “The arts allow students to delve more deeply and viscerally into big ideas and discover new ways of thinking and being, as well as helping them undermine the false compartmentalization of different subjects that exists within schools.” His words got me wondering how I could incorporate art in my classroom. I got up an extra hour early one morning the week before Spring Break and made a huge batch of no-cook play-dough. I figured if we were going to use play-dough, we might as well do it during a week when the kids find it difficult to pay attention. I’d written a lesson plan incorporating Rick Wormeli’s ideas about using metaphors in the classroom. The students were getting ready to do some writing about their eighth grade experience. They were supposed to reflect on who they were as they first entered the eighth grade, and who they had become. 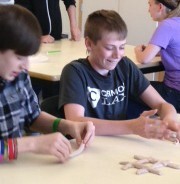 To get their creative juices flowing, I had students work in small groups to create a play-dough sculpture of something that represented what eighth graders are like at the beginning of the year. My only caveat was that they could not use any kind of human figure; this helped reinforce creating a metaphor. I had them do the same thing with an ‘end of year eighth grader’, and told him they would be explaining and defending their choices with the other groups. I cannot begin to describe how excited, and completely astonished my students were when I pulled out my homemade play-dough. Their eyes lit up, and they couldn’t wait to get their hands on the dough. The conversations that followed were amazing. While they were kneading the dough, they were having quality conversations about how they had grown as students, friends, family members, and athletes. The group metaphors were creative and thoughtful. Some of the groups wanted their metaphors to completely relate to each other so they came up with things like a caterpillar and butterfly. Other group’s metaphors were unrelated, yet precisely embodied an eighth-grader at both stages of the year. Once I had given the groups time to sculpt, the entire class was invited to a gallery walk. We started in the ‘east wing’ of our museum and moved on through various ‘rooms’ of the museum. At each cluster of desks, the group the sculptors had to share what they had sculpted and why they felt their metaphor best embodied an eighth-grader. At each table, feedback was given about the sculptures – not the quality of the artwork, but the quality of the metaphor. Getting the kids up and moving was exactly what they needed the week before vacation. They were energized and full of great ideas. After the gallery walk, I sent them back to their original seats and asked them to individually sculpt the most important thing that they had learned about themselves in eighth grade. 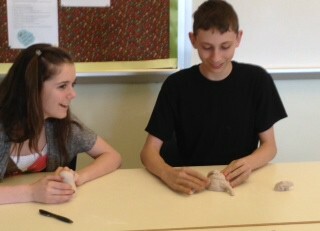 I allowed them to talk to one another while they were working on their sculptures. As they worked and shared with their group-mates, I went around the room taking pictures and asking questions. We concluded with a whole class share. By that point the students had an entire collection of ideas about the metamorphosis of an eighth grader. As soon as I’d explained their writing assignment, I asked them to spend some time brainstorming and make a list of ideas on the back of their papers. Rather than having a bunch of blank stares, I found that even the students who generally take a lot of time to process immediately had ideas to get on their paper. Make sure there’s enough flour in the dough so it’s not too sticky. Make sure that you make enough that everyone can have a good-sized piece of play-dough when it’s time to do individual sculptures. Make sure we have enough time to play with the play-dough and get ideas. Even though I had visions of something resembling a food-fight happening in my classroom, I found that the students were excited to be allowed to use play-dough and made sure that they maintained the privilege. Thank you Mr. Block for inspiring me to use art to facilitate the writing process. I am excited to find new ways to incorporate art in my lessons! How do you use art to facilitate thinking in your classroom? Previous PostAm I Out of My Mind? !Next PostGet Ready! Get Set! Hit the Classroom Track!